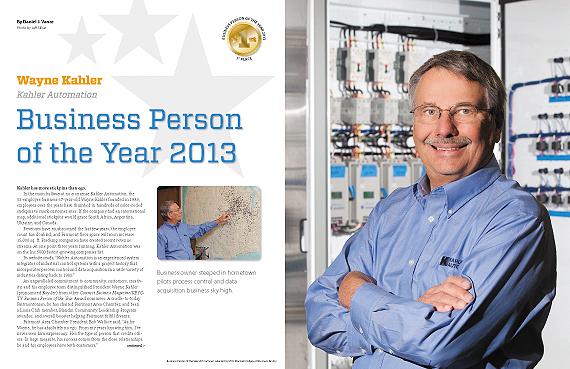 Business owner steeped in hometown, pilots process control and data acquisition business sky high. Kahler has more stickpins than ego. In the main hallway at no-nonsense Kahler Automation, the 53-employee business 67-year-old Wayne Kahler founded in 1989, employees over the years have thumbed in hundreds of color-coded stickpins to mark customer sites. If the company had an international map, additional stickpins would grace South Africa, Argentina, Ukraine, and Canada. Revenues have mushroomed the last few years, the employee count has doubled, and Fairmont floor space will soon increase 15,000 sq. ft. Fracking companies have created recent revenue streams. At one point three years running, Kahler Automation was on the Inc.5000 fastest-growing companies list. An unparalleled commitment to community, customers, creativity, and his employee team distinguished President Wayne Kahler (pronounced Kay-ler) from other Connect Business Magazine/KEYC-TV Business Person of the Year Award nominees. A cradle-to-today Fairmontonian, he has chaired Fairmont Area Chamber, and been a Lions Club member, Blandin Community Leadership Program attendee, and overall booster helping Fairmont fulfill dreams. I’ve always been interested in technology, which is how we got into automation. I was working with my dad, an electrical contractor, who owned Kahler Electric. I had a self-taught interest in electronics and computers. As time evolved at Kahler Electric, there were more and more opportunities to do automation involving electronics and computers. Today, I love seeing technology implemented. The challenge of trying to solve problems for customers is almost a disease with me. It’s really easy for me to set aside a proven project and jump into a new, unknown project to see if I can help come up with a good solution for a customer. It’s that process that keeps me interested in the business every day. That said, I’m more of a bolts and nuts, mechanical guy. That’s the old electrician in me. You wire up a bunch of lights, flip a switch, and something works. A bit of that carries on with me into our automation work—seeing a final result that works is a really important aspect of business for me. I have been flying since age 16 and it’s my favorite thing to do. We have two company airplanes that move our engineers and salespeople around the country and I have another airplane I keep at home, a Kitfox two-seater, similar to a Piper Cub. Do you have a company pilot? We have three people here who can fly, and in addition we have on-call pilots in Fairmont. I personally don’t fly the company airplane on business. When out on a call, I let someone else fly because on the way to a call I’m mentally trying to focus on what is going to take place at the meeting. Flying is a full-time job. What advantages are there to having company airplanes? The type of work we do is typically in smaller communities within 600 miles of Fairmont. Without our own planes, we would have to drive to Minneapolis, get on an airliner, go to say St. Louis, for example, and rent a car. It could take a full day just to get to a customer. But with our own planes, we can be there in two hours, do our work, and often return the same day. This improves our ability to service customers. Many of our systems are crucial to our customer’s production or operation, so if those systems break down, and we can’t make corrections over the Internet, our customers can get quick service. Do the airplanes give you an advantage over competitors? Our competitors do not have airplanes. We can provide faster service. Give a specific example of when that was really crucial? We have several customers that unload ships and load trucks and railcars with fertilizer. One of those customers in Galveston, Texas, was hit by a hurricane. The airport was open, but had minimal lighting. Several days after the event, they discovered water had entered one of their control panels for the rail load-out. They had a ship that needed unloading because it had been idle for some time waiting for the hurricane to pass. An electrician there tried repairing the control panel, but couldn’t. So we sent two technicians and a box of parts on one of our airplanes. They arrived in Galveston at night on a runway with only four lights. They landed and got the customer up and running, which helped get the ship unloaded. We’ve done those things for customers after tornadoes and lightning strikes. Describe the size of your company? Our revenues are in the $12- to $16-million range. In terms of employees, we have more than doubled over the last four years from 24 to 53. In part, we employ engineers, electricians, technicians, and computer programmers programming in a variety of languages. We can write just about any computer language to accomplish a project. So we have people who not only can write the software for the controller out on the factory floor, but also can take the factory floor data right into their accounting packages. We have people in-house that write interfaces from the factory floor controllers into the desktop computers in the office. The majority of our customers are in the Midwest where crops are grown, but we have done projects in Argentina, South Africa, Canada, and the Ukraine. I just got off the telephone yesterday with people from Australia. Our focus had been the U.S., but we’ve been getting inquiries from all over the world. Certain manufacturers that make conveyors and blenders have been asking us to build the controls in order to supply a complete package to end-users. U.S. herbicide/fertilizer bulk customers make up about 75 percent of our business. Industrial customers make up 18 percent of our business, and we’re making testers for their products. We do grain handling for large grain elevators, which is almost five percent of our business. And we do sand-fracking control systems, which represent three percent of our business, and that segment is growing rapidly. Let’s look at the 75 percent portion of your business. Describe exactly what you do for those customers. We help customers mix and blend a variety of dry and liquid products. Dry products could be urea or potash, for example. With those customers, we might have a control package that could help them call up an order that had been made up to years before, and automatically perform the blend for the grower to pick up. As soon as it’s been blended and measurements taken by a scale, which we control, we can import that information to the accounting software for billing. On the liquid side, we usually help clients with liquid herbicides, but liquid fertilizer is gaining in popularity because it can be put on as needed throughout the growing season. We have a variety of 24/7 dispensing systems where a grower can help himself if he’s got the right PIN code to get into the dispensing system. One challenge for us has been adapting to the way farmers throughout the U.S. operate at point of sale. Here in Minnesota they do it one way, but in Nebraska or Illinois they have a different twist. So we have developed modular systems to adapt our packages to the area grower’s needs. Besides point of sale, we’re involved in dry materials, for instance, from the mining and wholesale chain to the coming off ships or rail through distribution points and points of sale. Our sand fracking customers are primarily in Louisiana and Texas, and with one system in Canada. We have proposed quite a few in North Dakota. Essentially, any process that needs electrical controls or software to operate is an opportunity. We’ve had to step away from some opportunities because we have so much on our plate. Who and what made you into the person you are today? Many people in Fairmont had a hand in it. I grew up in Fairmont, graduated from high school here, and have been a lifelong resident. I started working with my dad when I was eight years old. He had a two-man electrical shop through which I had opportunities to meet and see area businesspeople in action. That had a really strong influence on what I thought I wanted to be. What made these businesspeople unique? One that sticks really strong in my mind is Anchor Nelson, who ran an ice cream company. He was an entrepreneur extraordinaire and after selling his ice cream business was an investor in many ventures in town. He brought a lot of industry to town by being a silent investor. Because of my father’s business, I had the opportunity to know people like Anchor. I looked up to and wanted to emulate those kinds of people. He was a risk taker willing to invest in Fairmont. He usually found people in the community he thought could do the job. I’ve tried to emulate that. I was always impressed by his perseverance and willingness to stay in one spot and not leave when times got tough. You mentioned Anchor’s risk taking. What is there about risk taking you enjoy? Being able to decide the things to risk—whether money, time or energy—is what I admired about him. Today, I enjoy calculating risk and deciding what it’s going to take to win. I find that admirable in others and rewarding in my own efforts when things work out. You study how deep the water is and decide if you can make it across. And when you do, it’s very rewarding. What about your career path? My parents were a strong influence. The fact I worked with my dad from very young on influenced me. In turn, I’ve been blessed having my son here the last eight years. He graduated from Iowa State and is in charge of product development. While 16 and working for my dad, I passed my first electrician’s test. So I’ve been a journeyman electrician more than 50 years and got my master’s license a few years later. After graduating from high school in 1962, I went to a trade school in the Cities, Northwest Electronics. This began my interest in computers. While attending there, I worked for Control Data and then Univac. I returned to Fairmont a year and a half later, and would buy books about computers and read up on and buy small computers and experiment. In the early 1970s, I started doing automation work as part of Kahler Electric. I began putting small programmable logic controllers (PLCs) on machines and wiring the machines for customers. Right off the bat, I was given large projects, such as putting in multiple PLCs that operated the refrigeration for large plants. We were getting involved on large-scale control projects that included writing software that could not only control the process, but also report what was going on within the process, such as how many, what, and how long to chill a product, for example. The data helped customers understand or change their processes to be more efficient. Today, we not only automate processes, but also collect data. Right now, I’d say data collection is more important to a customer than automating the function. Let’s take a manufacturing process where the company is making a product that needs to hold pressure over time. We’ve developed text fixtures for them that will automatically go through and test the device to see how long it holds pressure. They can make minor changes to their product to see if it holds pressure better and longer, and verify the changes they made were proper. We have several manufacturers we’ve done test fixtures for allowing them to weld up cranes, equipment, and the design of the welding fixture. How it operates can save them time and help produce product faster. When did Kahler Automation split from Kahler Electric? We spun off the automation department in ’89 and started Kahler Automation with three employees. We’re currently at 53. Both the people starting with me in ’89 are still here. We have a lot of long-term employees. You don’t have to recruit in the Twin Cities to find excellent people. They are already here in Fairmont. How difficult was it getting your business off the ground? At first, people were asking what an electrical firm knew about automating processes. Thank goodness there were people who saw we could do the job and allowed us to do it. Every time we finished a job, it was another feather in our hat—like earning a college degree. A lot of our work then and now comes through networking. A manufacturer might tell another, ‘Well, I had Kahler build me a test fixture’ and we’ll get a call from that customer looking for a solution. Reveal one of your biggest mistakes. Many years ago, we tried figuring out how to mold certain parts out of recycled rubber, such as a part that could protect the road concrete under a manhole ring. That didn’t work out. As a solution provider, it was difficult for us to say we couldn’t do it. We thought we could develop our own product line and make parts out of rubber tires. One problem we had was the variability in the curing process due to natural humidity, and another was the rubber not being consistent. In some cases, the rubber would come out of our molds slightly out of tolerance. We spent more than a year trying to make repeatable parts. This whole process reminded me I was an electrical guy and should stick with that. I’m not a chemist, and we didn’t have anyone that understood the chemistry involved. You’ve been described as a person who’s always looking at what the next thing is going to be. What is the next thing with your company? I would say supplying the equipment for sand fracking systems. We’re rapidly expanding into an international marketplace that wasn’t part of my game plan just five years ago. Over the last couple years, we’ve had opportunities to supply this equipment into other countries through the request of U.S. companies. Of course, there’s a learning curve involved with doing business overseas. For instance, the voltages and packaging requirement for other countries often aren’t the same as ours. No. But we send start-up technicians that review what has been installed to see if it’s ready for powering up. He helps train the operator in how the system functions. A typical international start-up can last two weeks for us. During our walk-through before this interview, you were talking with me about the way you heat and cool your building using geothermal heating and cooling. We circulate water through a closed loop system beginning in the ground, where the water is 53 degrees. It comes back up into the building. We use heat pumps to raise the water temperature to 105 degrees in the winter and in the summer we cool the water to 45 degrees and circulate that through. We are heating and cooling our entire 21,000 sq. ft. facility for about $600 a month. The catch is the 10-year payback. It cost us $93,000 for the heat exchanger and 44 closed-loop wells that each go down 200 feet. What’s your philosophy on the kind of business and work environment you want to create? The first is professional, then comfortable, where people can speak out if they feel a need. I try treating people as I would like to be treated. I like people taking pride in what they’re doing. To help build that pride, we recently took a large group of our employees to a large Watonwan Farm Services grain facility in Delavan where we did the automation. We took a tour and went out to eat on the way home. We’ve done that before. What would it take to get someone fired here? Not showing up to work or theft would be major issues. I depend on people being here and fulfilling pledges we’ve made to customers. I work with people—and after all, we are all human and we all have our weaknesses and strengths. We try making adjustments to get employees in spots where they can succeed. Name some of your customers in our reading area over the years. In North Mankato, MICO and WisPak; Sanborn Manufacturing in Springfield; WFS in Delavan; Crystal Valley Co-op in Madelia; CrownTonka in Winnebago; BirdsEye in Waseca; LeSueur Inc.; and New Ulm Precision Tool. What growing pains have you had? We’re adding on 15,000 square feet. As for people, we try to give them mentors to help them get up and running quickly. Recently, we ran an advertisement for five new positions and filled four of them with people from the Fairmont area. The other person is moving to Fairmont. One growing pain can be just financing more business, but we have a good banking relationship in town with Profinium Financial. I’ve got a lot of great people to help minimize the pain—and yes, there’s pain. But much of it we would deal with every day anyway, such as making deliveries and finding parts on time. Our magazine’s philosophy is that a business reflects its leader. How has your personality helped create the environment that’s caused this business to succeed? I’m a facilitator that brings on people with talent and gives them the authority to do what they need to do. I’m not a micromanager. My life would be a mess if I were trying to take care of sales and purchasing and everything else. I try delegating and I’ve been fortunate to find good people willing to take on responsibility. I try not getting too critical when things don’t go right. When things aren’t going well, I bear down and look into why. I can get pretty focused. But for the most part, when seeing a customer, I’m not high pressure. If you choose not to do business with me I’m not going to keep putting my foot in the door. I don’t need to be pushy. Is a lot of your job responsibility still sales? It tends to be. With new markets and customers, I tend to be the guy at the meeting who says, “No problem, we can do that.” More of my focus has become managing the day-to-day operations. I enjoy going out and seeing my customers—and yet I don’t get much of that anymore. I miss it. That was a fun part of my job. Can this business prosper without you? I believe so. Bruce Gemmill has been with me more than 35 years—since our Kahler Electric days. Office manager Dawn Kot, marketing manager Steve Swift, and Dennis Turner, our “technical guru,” have all been here more than 20 years. My son has been here eight years full-time. It seems the fact you delegate responsibility has made this possible. If you were to leave, there would be others to carry on. That’s my goal. I’m already 67 and past the official retirement age. My health is good, but then I’ve also seen people whose health changed fast. You do have to think about those things when leading a group. Many people depend on us for their livelihood. Within the last four years, you’ve more than doubled in size. In terms of building space, you’re already planning on expanding another 15,000 square feet. Could you be doubling in size in another four years? Going back to 1989, I’ve kept track of how we’ve done since spinning off from Kahler Electric. Historically, we’ve had a couple years of growth and then reached a plateau for a couple of years, and then repeated the process. We’ve added a fair number of people recently. It takes time to adjust before growing again. It takes a couple years before their efforts help pull more work in. The building addition will give us more space for larger projects. We’re pretty full here right now, and this (late fall) is our slower season. It gets busier. But we’re also out of office space. Knowing what has happened the last five years, we’re going to need the space to accommodate what our customers will be expecting. Over the years, we’ve become a valued supplier for some large companies in the fertilizer/herbicide world. They count on us delivering. We do a lot of work for CHS’s agronomy department. We do some work for Rosen’s Diversified. Bayer pulled us into the Ukraine. With these larger companies, you have to be fair in your pricing and delivery. They are loyal and they expect you to deliver when they decide they’re going to buy. So part of our expansion plan is being prepared to take care of our current customers. Every year, they’re all buying a little bit more from us so the additional space will allow us to take care of that business as it arrives. Our revenues in the $12- to $16 million range have been growing steadily. On three different occasions we were placed on the Inc.5000 fastest-growing business list. I stopped wanting to be on that list because investment bankers and people wanting to invest kept pestering me. Since trying to attract capital was not a goal of ours, I stopped applying for the list. Would you sell if someone offered you twice what the company was worth? Not at this time—and there are reasons. I’ve got my son here and have loyal people that have worked here for years. I don’t know if selling would be fair to them. I believe in Fairmont. I hope we’re here for a long time to come. There is a risk in selling because the new owners could pull the company out of Fairmont. What makes you the happiest when seeing it occur at work? Again, it’s seeing the pride all my co-workers take in a job well done. When we went on that tour at the Watonwan Farm Services grain facility in Delavan, you should have seen the expression of pride on their faces as they saw what they had built and where it was actually installed and working. That was very satisfying. I enjoy going out to the open houses of our customers and hearing them tell me a particular employee has helped them. I really enjoy getting positive feedback on our team. That’s a real high for me. Family: Wife, Char; children Chantill (Bolton & Menk civil engineer) and Logan (Kahler Automation). Partial list of organizational involvement: Lions Club, Fairmont Area Chamber of Commerce, and Fairmont Covenant Church.